Pat Spears: Ancestor Detector: Can’t Find the Answer? Derive It! Can’t Find the Answer? Derive It! Budget makers often talk of “backing into a number". In other words, you don’t start with the number; you derive it or calculate it from the data you have. This same thinking process can be used with genealogical research. You may have a piece of information but not the whole story. You may need to derive part of the story that is missing by looking at the data you can find and drawing a conclusion. 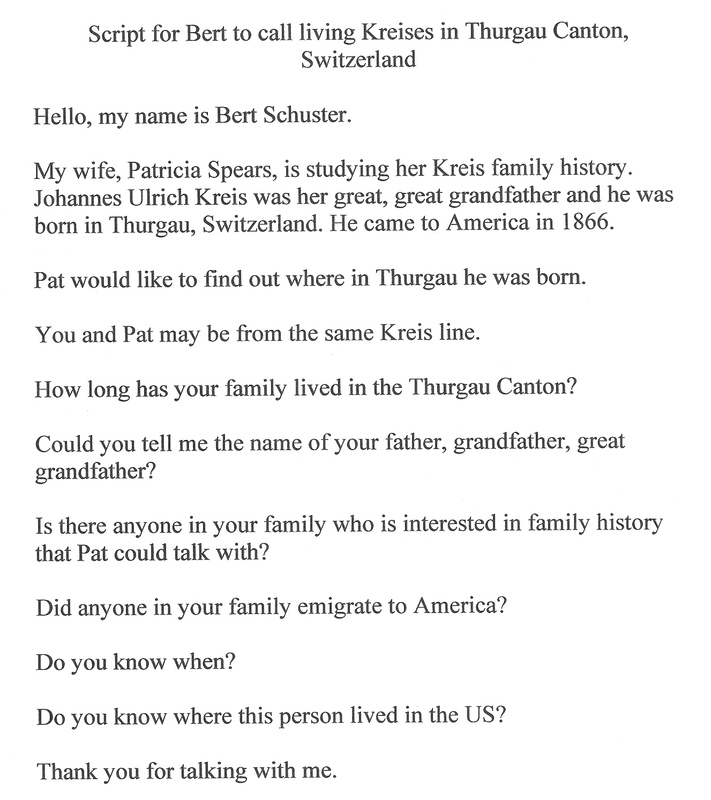 My great, great grandfather, Johannes Ulrich Kreis, called “John” in America, was born in Switzerland. This information came from several records, including census documents from 1910, 1920 and 1930, his naturalization card, and his death certificate. 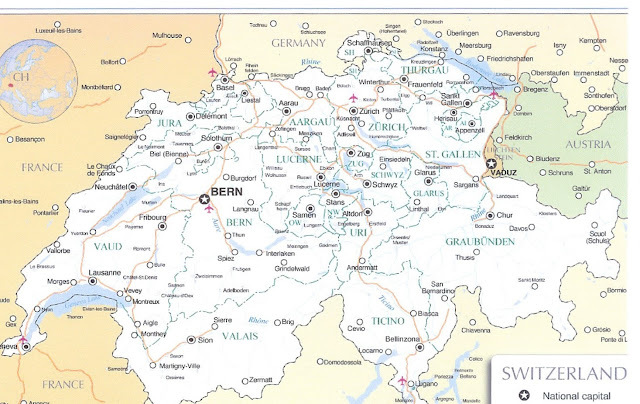 Like most genealogists, now that I had the country he was from, I wanted to know more – where in Switzerland was he born? After looking for months over the records I already had and scouring the internet for any ones I had missed, I still was no closer to finding John’s birth town. Now I had something to go on. I had narrowed the field. Suddenly my search for John Kreis’s birth town had become more focused – there was some evidence that he was born in Thurgau. 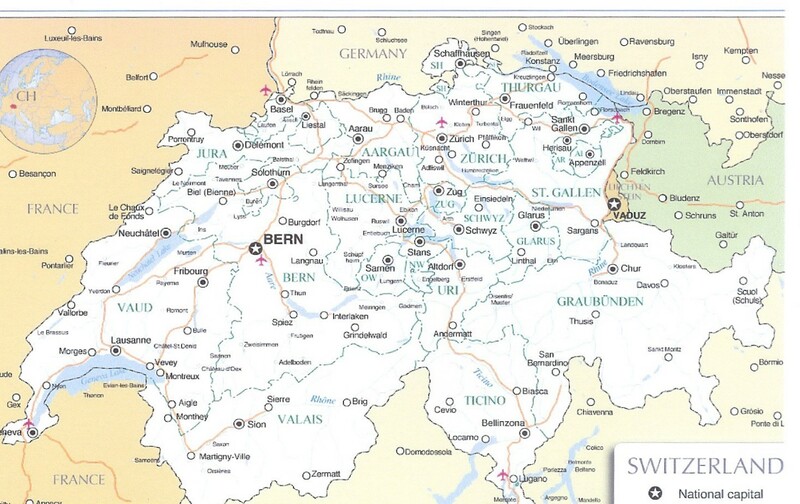 I could focus my efforts on one district in Switzerland instead of laboring on all the districts which would be overwhelming and so time consuming! But I found that I could narrow the target (John’s possible birth place) even more. As I looked over the search results, I saw that several towns or villages kept reappearing in the list: Arbon, Egnach, Ermatingen, Neukirch an der Thur, Sitterdorf, Weinfelden and Zihlschlacht. Now I had some data that was narrow enough to actually do something with. I needed to see if any living Kreises were to be found in those seven most commonly occuring towns. This is where the old fashioned telephone directory, now on-line, comes in handy. I first went to Numberway which is a “free…guide to telephone directories on the web.” It is “the easy way to find phone numbers all around the world.” When I selected “Switzerland” on the Numberway search page, I was directed to the official Swisscom White Pages. 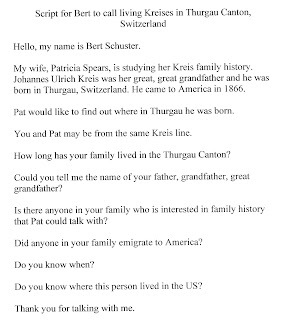 In the search window, I put “Thurgau, Switzerland” and searched for Kreis as the last name. I searched by several first names in until I had quite a number of people to contact. To narrow the field, I filtered by town/village, looking only at the seven towns of interest. Now, here is where I have some special help that may not be readily available to many genealogists. My husband, Bert, is German and is totally bi-lingual in German and English. What good luck for me that my Kreis line is from German-speaking Switzerland! Instead of me calling the Kreis men on the list and hoping they can speak English, Bert will call in German! I created a script that Bert could use to begin his conversations. He then translated the script into German. In order to capture main points in the conversations, I created a “recording form”. Now the preparations are ready and Bert can begin calling. As we collect some data, I will be able to write a post about our experience. 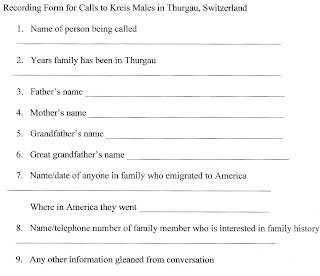 And just maybe I might be able to dervive some answers to my Kreis family history puzzle.